It’s not every production that Spokane Civic Theatre Artistic Director Lenny Bart suggests audience members “wear (their) Depends,” but a show like “Noises Off” calls for such a precaution. “Some of the laughing may bring results you’re not prepared for otherwise,” he said. The Michael Frayn farce opens Friday at Spokane Civic Theatre. 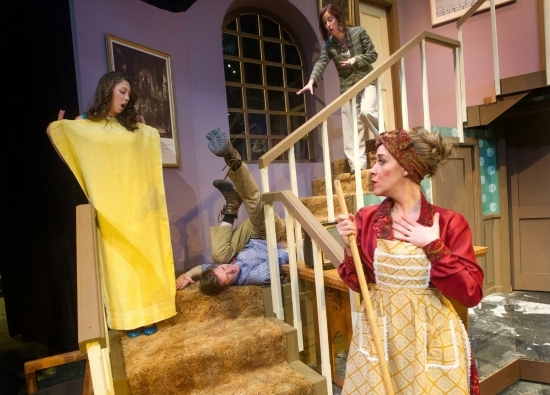 “Noises Off” follows a theater company as it tries to get its production of the farcical “Nothing On” off the ground. Act One finds the cast at rehearsal the night before the opening performance, struggling with everything from entrances and exits and missed lines to which props to use when, all of which nearly drives director Lloyd Dallas (Jerry Sciarrio) to his breaking point. Act Two jumps the story ahead one month, to a matinee performance of “Nothing On.” It’s here that the audience sees just how dysfunctional the cast is. Dallas is involved in a love triangle with the emotional assistant stage manager Poppy Norton-Taylor (Mikyla Bordner) and actress Brooke Ashton (Rushele Herrmann), who vows to perform her role as written, no matter the chaos around her. “Nothing On” star Dotty Otley (Audrie Pursch) is in a relationship with the much younger actor Garry Lejeune (Jack Fogarty), who stutters his way through conversations unless it’s dialogue from the play, and veteran actor Selsdon Mowbray (Gary Pierce) has a drinking problem that keeps the stage crew on its toes. Completing the cast are Kyle Ross as the well-meaning but dim-witted Fredrick Fellowes, Laticia Brannon as Belinda Blair, a reliable actress who can sometimes be a gossip, and Samuel Peters as Tim Allgood, the over-worked stage manager. In the final act, tensions are high as the company approaches the end of the run of “Nothing On.” Things on and offstage go even further downhill, leaving cast members to do what they can to make it to curtain call.